I'd like to take my mind off the nasty business of politics for a moment, and celebrate the recent success of the feature film Love, Simon. 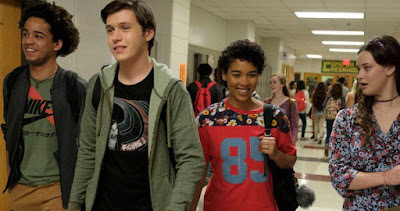 The film, starring the lovely Nick Robinson and joined by a fab cast, is based on the novel Simon vs. the Homo Sapiens Agenda by Becky Albertalli, and tells the tale about a closeted teenager who develops a secret email/pen pal relationship with another closeted teen in his high school. Director Greg Berlanti handles it all delicately and beautifully, giving this story a common touch that is allowing it to find mainstream audiences. While there is some typical rom-com formulaic writing (and you just know that this has to be headed for a happy ending), the story and diverse characters were still original and well-acted enough to keep it fresh and compelling. As of March 30, its estimated $30 million at the North American box office already far outstrips the entire run by the recent Oscar-nominated Call Me By Your Name. Why? The producers clearly wanted this gay story to appeal to the masses and it appears to be doing so. I went to an opening night screening on March 16 in Toronto and it was pretty packed, with a majority young females. At a key moment of sweet, romantic, boy-on-boy kissing action, those girls squealed with delight and made the movie going experience sublime. That stands in stark contrast with the howls of hatred and homophobia that would accompany the appearance of any gay characters onscreen in decades past in North America. There will be those who quibble with the fact this is another in a short list of mainstream feature films where the lead gay character is masculine, cisgendered and white. The plot finds a way to effectively counter some of those quibbles (I won't give anything away here), including the fact that the lead is always surrounded by characters who are quite diverse in terms of backgrounds. Of course, this is just one film and LGBTQ characters still have a ways to go on screen. The recent Black Panther is one example where a mainstream film erred on the side of too-much caution by refusing to make the lesbian relationship in the original works explicit in the feature film adaptation. Fans looking for queer representation in the recent Star Wars reboots continue to be disappointed too. It's one thing to gamble $17 million on Love, Simon (a gamble that has already paid off big time.) It's another to gamble $400 million on a picture that depends on worldwide box office success to make a profit. And as we know, homophobia and bigotry still reigns in most parts of this world. This issue has been with us for decades and continues to be relevant.